There is seems to be a strong sense of inauthenticity with the vast number of bands who are suddenly unplugging their guitars and calling themselves “Americana” now. But soon enough, another genre will come along and be ripe for exploitation. And when it does, you can bet Riley Moore, a refreshingly genuine voice in the Americana/Folk movement, will still be playing his brand of no frills, but deeply satisfying music from that genre. 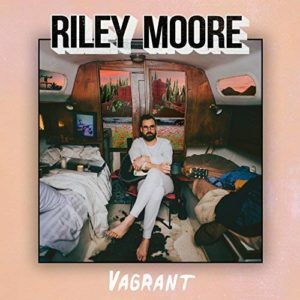 On “Vagrant,” his debut, Moore occasional digs deep into his own experiences for fodder, like on “Pancakes and M&Ms” about his childhood in Tennessee. Lyrically Moore has a knack for quirkiness and taking seemingly exhausted subjects and giving them a fresh perspective thanks to clever wordplay, bringing to mind folks like John Prine and Louden Wainwright III. “Sitting On a Boat,” is a perfect example. It could easily come off like a Jimmy Buffett outtake if not for Moore’s wry lyrics and deadpan delivery. Even the album closer, “I Love You” manages to breathe new life into a seemingly standard love song. Over the span of just eight songs, Moore manages to give Americana a bit of its credibility back and shows the upstarts and faux folkies how it should really sound.